The president said he "never will be" a fan of the late senator. Meghan McCain and "The View" co-hosts defended McCain's late father Sen. John McCain after President Donald Trump's latest attacks on him. The president condemned Sen. John McCain over the weekend for being "last in his class" and again on Tuesday saying that he was "never a fan" and that he "never will be" after McCain voted against repealing Obamacare. The longtime senator and former prisoner of war died seven months ago. On "The View" Wednesday, Meghan McCain said, "If I had told my dad seven months after you’re dead, you’re gonna be dominating the news and all over Twitter, he would think it was hilarious that our president was so jealous of him that he was dominating the news cycle in death as well." "There are kids committing suicide because of cyberbullying online, there are people going through rough times. There are veterans who come back — we have 20 veterans a day committing suicide," she said. "Focus on these issues. These are the issues I beg the White House to pay attention to." Meghan McCain was surprised by Trump's continued focus on her father, calling it "a new, bizarre low." "Attacking someone who isn’t here is a bizarre low, but my dad’s not here but I’m sure as hell here," Meghan McCain said. "Every single time they take a swing at us: ABC News, 11 o’clock on the east coast every day, guys." "Do not feel bad for me and my family," she continued. "We are blessed, we are a family of privilege. Feel bad for people out there who are being bullied that don’t have support. That don’t have women of ‘The View’ to come out and support their family." Cindy McCain, the late senator's widow, received a threatening message from a hateful stranger and shared it on Twitter. Along with a photo of the private message, Cindy wrote in her caption, "I want to make sure all of you could see how kind and loving a stranger can be. I'm posting her note for her family and friends could see." 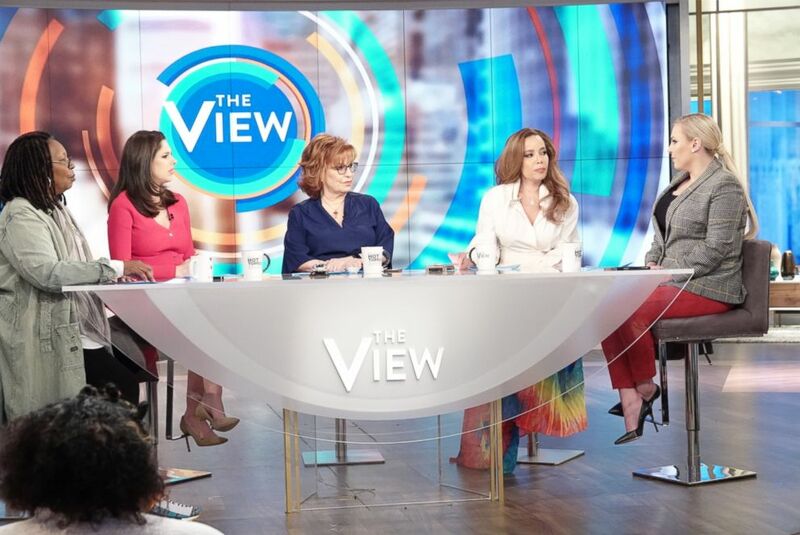 (Nicolette Cain/ABC) Whoopi Goldberg, Abby Huntsman, Joy Behar, Sunny Hostin, and Meghan McCain defend McCain's late father Sen. John McCain again on "The View" on March 20, 2019. Sunny Hostin spoke about the threatening message sent to the grieving widow, reminding viewers that "there was a time in this country where families of politicians were off-limits," and called for the White House to denounce bullying. "There was a time in this country where certainly you wouldn't attack them publicly and you wouldn't attack them on the internet." "Now that the bullying comes from the top, the bullying comes from the administration, I would like to see that bullying be denounced not only from the Republicans but also from the White House." Hostin also brought up First Lady Melania Trump's anti-bullying platform "Be Best." "Why is Cindy McCain being bullied? Why are her children being attacked?" Meghan McCain also expressed her gratitude for the support of her fellow co-hosts on Wednesday. "There is real sisterhood and support at this table," she said. "We all support each other. First and foremost, the support I have and love from this show in particular, thank you, all of you, for real." On "The View" on Monday, Meghan McCain and her fellow co-hosts fired back at Trump's tweetstorm from over the weekend where he verbally attacked the family. "Your life is spent on your weekends not with your family, not with your friends, but obsessing — obsessing — over great men you could never live up to," Meghan McCain said about Trump.